The founder of Warwick Manufacturing Group, a man who "encouraged many firms to locate in Britain", has died. 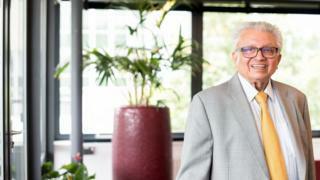 Professor Lord Bhattacharyya, 78, who started WMG in 1980, played a key role in enabling car giant Tata to take over Jaguar Land Rover. The University of Warwick said he "set the standard" for how universities should work with industry. Business Secretary Greg Clark said the research and education group's chairman had been a "heroic figure". Mr Clark said: "Through the WMG (Warwick Manufacturing Group)... and through his extraordinary energy and tenacity Kumar encouraged many firms to locate and expand in Britain. "Hundreds of thousands of people in Britain owe their livelihoods to Kumar Bhattacharyya." Lord Bhattacharyya came to Birmingham from Bangladesh in his 20s and became an influential authority on economic and industrial policy. Birmingham City Council leader Ian Ward said on Twitter his "ability to transcend party politics and to be respected by all sides is testament to his great understanding and knowledge of business and industry". University Council chair and pro-chancellor Sir David Normington said he knew of him "as an adviser to successive Prime Ministers and Secretaries of State". Sir David said he was "a force of nature", who "pushed at boundaries" and "changed lives". He added: "Most of all, for so many of us, he was also a kind and generous friend." The university said Lord Bhattacharyya passed away after a short illness.